There are numerous options to consider when commission religious stained glass windows. Generally, they include window design style, glass type, hand-painted detail, and design intricacy. Window styles range from very abstract, contemporary work to very traditional, handpainted work. Not all studios are capable of producing every style. Ask to see a portfolio of recent works matching the desired window style for your project. Most studios gladly provide a color design for the window they propose prior to a contractual agreement. Remember, a studio which has difficulty conveying the window design on paper many have equal difficulty producing the design in glass. If they can’t draw it, they can’t build it. Mouth-blown window glass – Mono-color or multi-color glass with light and dark areas due to slight variations in glass thickness. The handmade nature of this glass gives the glass character and adds depth and interest to the overall design. This grouping includes fine glass from Poland and Germany as well as some domestic sources. Within these three glass types, there are variations too numerous to recount. Inquire as to the type of glass to be used on your project. Fine mouth blown glass can cost 4 to 5 times more than opalescent and machine rolled cathedral glass. Details such as faces and hands of window figures are hand-painted. Painting on glass is a labor-intensive effort. When fired at 1200 degrees, the paint becomes permanently fused to the glass piece, but often, a piece of glass is painted and fired multiple times to add depth and detail. Not all studios have in-house artist capable of painting on glass because, as with any art form, the style and talent of stained glass artists varies greatly. Lynchburg Stained Glass is capable of producing painted window work in fine detail ranging from painted medallions to fully painted figurative scenes. Basically, the smaller and more irregular the glass pieces, the more difficult the window is to glaze (assemble). Each piece of glass is hand-cut and individually glazed into the window with lead came. A quote based on providing a window with a specific number of pieces can be misleading if not accompanied by artwork. For example, consider two windows, each with 100 pieces of glass. The first design is predominately rectangular pieces with lots of straight lead lines and uniform borders. The second is a more irregular, figurative window where no two pieces of glass are the same size or shape. As you might imagine, the second window is the more costly design. Always insist on seeing a design of the proposed window. Hand painted detail and piece intricacy are the two factors most affecting the cost of stained glass. The fundamentals of constructing a stained glass window are independent of artistic content. Regardless of the cost of the window, the quality of the window is the same. Every window is hand-assembled using lead came between the glass pieces, hand soldered on both sides, waterproofed on both sides, and reinforced with steel brace bars. Does the studio offer aluminum frames and clear coverings to protect your stained glass investment? Lynchburg Stained Glass fabricates custom aluminum frames specifically designed for use with stained glass. We are capable of producing intricate frames requiring special bends. Our frames are engineered to comply with building code requirements for wind load. Our recommended clear protective covering is laminated glass. Laminated glass is impact resistant and will not discolor with age. Avoid plastic covering products. They have a reputation of scratching and “yellowing” to the point that they obscure the stained glass. Is the studio equipped to handle installations of large church projects requiring scaffold and/or lifts? Lynchburg Stained Glass maintains multiple in-house installation crews and provides scaffold and lift access as necessary. Is the studio capable of producing the work in a timely manner to meet your construction schedule? Is the studio capable of providing a turn-key project including frames and protective covering? Lynchburg Stained Glass is a large full-service studio offering custom frames, protective covering, installation, and repair. Our large studio (approximately 30 artisans) is capable of producing large church projects in a timely manner. We maintain a large glass inventory to facilitate production. Does the stained glass window studio offer a warrantee? Lynchburg Stained Glass studio provides a 10-year warrantee covering material and workmanship. Can the stained glass window studio provide a certificate of insurance indicating liability coverage for the church while on site? Lynchburg Stained Glass studio maintains liability insurance coverage for the purpose of protecting the church. Ask for and check the stained glass window studio’s references on projects they have completed recently (within the past two or three years) for churches of the same size or larger than yours. If possible, take a trip to tour the studio where the windows will be produced. If cost is a factor and you plan to get prices from several different studios, make sure you understand exactly what each studio is providing for the cost quoted (especially concerning the intricacy and amount of hand painted work to be incorporated into the design). Above all, make absolutely sure that you get what you want when purchasing stained glass… it will be there for a very long time. Remember that you are purchasing a work of art, not an assembly line, machine-produced product. We will gladly meet with your group to discuss options and present ideas for stained glass. Our artists welcome your input on religious theme, color and style. Translating your ideas to glass, we develop color artwork for your approval. Stained glass is a vibrant art form that speaks to your church and to the community. We welcome the opportunity to help convey your message in glass. We can also repair religious stained glass church windows. 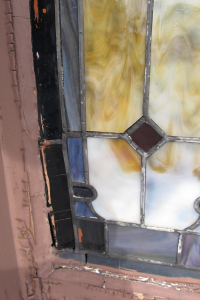 Lynchburg Stained Glass studio offers a full range of restoration services ranging from a few minor glass repairs to complete re-lead restoration, the process by which the entire window is disassembled and re-crafted with new lead. We also offer protective storm covering to protect your stained glass investment. Our stained glass storm covering system uses impact resistant laminated glass set into a small profile aluminum frame.